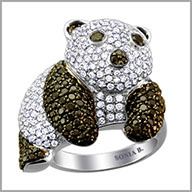 14k white gold panda ring,3.0325 ct of white and black diamonds. Take a friendly face with you wherever you go! An ornate creation of polished 14K white gold, this panda ring comes to life with 265 round full cut white diamonds and 131 round full cut black diamonds in pave settings. It is completed with an undergallery for a chic and comfortable wear every time. The total diamonds weight is approximately 3.0325ct. with G-H in color and SI in clarity.